The long awaited Battlefield 3 released by EA Games was definitely worth the wait. Battlefield fan or not this installment is a must for shooter fans. The icing on this cake is the Frostbite 2 engine. The engine provides stunning detailed visual enhancements in regards to gameplay. Players are immersed into the battlefield with captivating action scenes. Let’s first talk about the campaign. For the longest time, Battlefield was a multiplayer centered game so taking on a story campaign was a bold challenge to undertake. There is an element in campaigns, especially in shooters, that instills fear in their developers and that is the story line; the most difficult aspect to create. Take Valve’s Half Life for example, great story line and top single player quality, a classic. Now for a title that had hardly ever released a campaign, gamers didn’t know what to expect. Well no need to worry about spoilers, no specifics of the story line will be mentioned. As a huge shooter fan, I give the overall story line 7.5 out of 10. EA takes the generic heroic soldier type through a Hollywood blockbuster of conspiracy and national crisis. Of course there is always the character that exhibits the typical bureaucratic and political constituent for that red tape feel. It is definitely worth the play for it’s a great chance to take the full advantage of what the Frostbite 2 engine is capable of. Now let’s look at the Multiplayer aspect. As mentioned earlier, multiplayer is what Battlefield 3 is known for and it does not disappoint. With numerous vehicles to operate and different roles to contribute, squad based shooters has never been more fun. There are different types of maps, from conquest to rush and traditional death match, it literally is a battlefield. There is plenty of player to player interaction, especially with servers up to 64 players on PC. There are also several coop missions gamers can play with a friend or others. missions up to 2 players. Plus there is a ranking system for players to earn military ranking as they progress. As expected, the return of the achievement system with loads of weapons, medals and dog tags to choose from. I trust gamers know why these mechanics are essential to shooters so I won’t go too much into it. I give the multiplayer action a 9 out of 10 rating. My overall rating for Battlefield 3 is 8 out of 10. Battlefield 3 will always be known for their multiplayer element. As for their campaign, as in any story, there is always room for improvement. It doesn’t necessarily mean that it should in anyway effect its possibility in becoming a best seller. 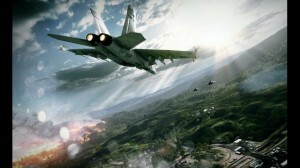 To add a little more excitement, Battlefield 3 Back to Karkand was just released with Frostbite 2 revamped maps from Battlefield 2 as well as new weapons, vehicles, and achievements. For those who purchased the limited addition, this expansion is free! If you don’t already own Battlefield 3, an awarding winning shooter of the year, in the collection of shooters, you are missing out! 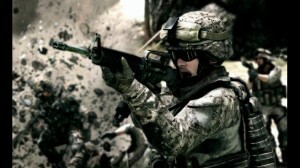 Battlefield 3 is available in PC, xbox 360 and Playstation 3. It is in stores now and digital copy prices may vary. The only thing that might take some getting use to is EA’s Origin system that is really similar to Steam. Origin is a game management system that provides multiplayer/coop game search ability. The game has come a long way since it’s release with several large patches. Overall, it is a really fun game.